My husband brought home a crate–a CRATE–of tomatoes from the farmers market. He purchased the lot for $10 but it was obvious the low price was due to their undeniably, indubitably overripe condition. 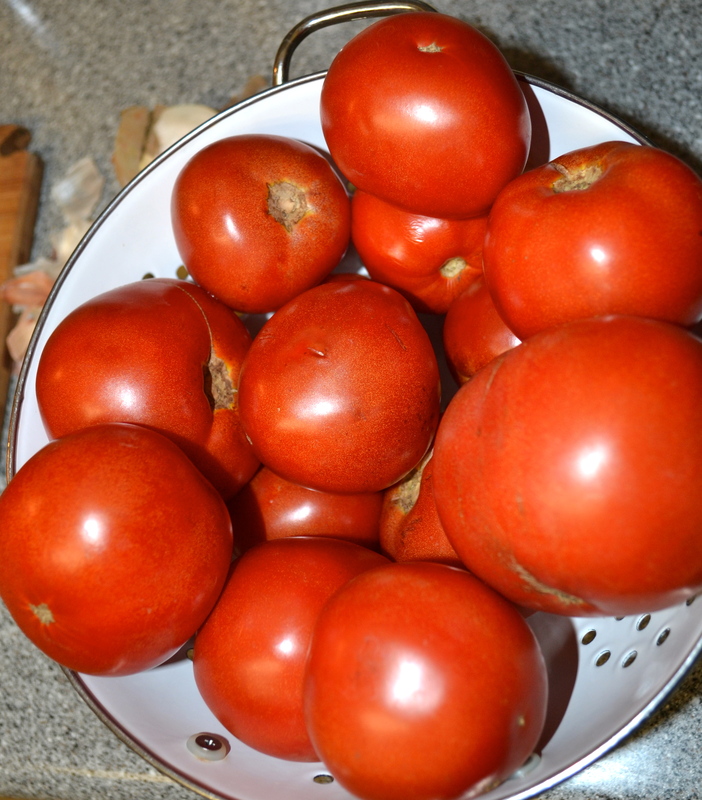 What to do but make a tomato sauce? 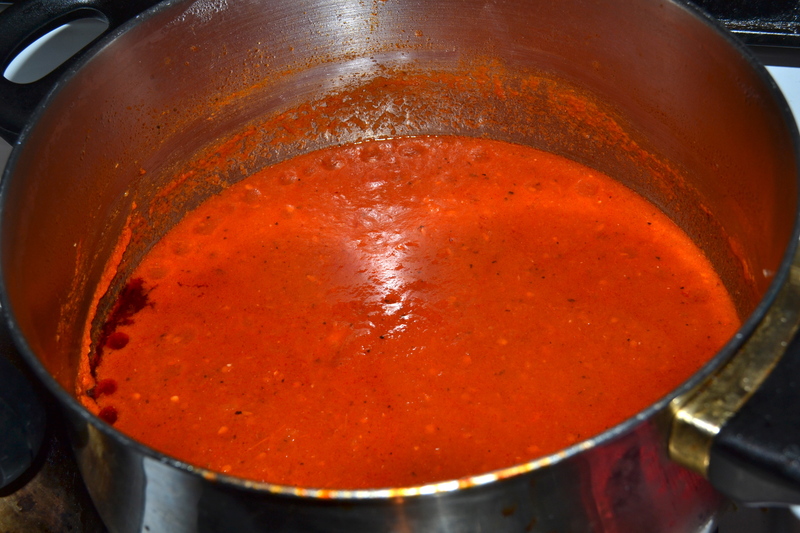 As I’ve written before, yummy and quick tomato sauce from a can of plum tomatoes will always suffice, but there is a differently delicious taste to be had with fresh sauce. And it’s not like it’s that much harder. You don’t need to watch it or nurture it or care for it in any way. You just need to be home. 1. Peel, slice and chop an onion, or two onions if you are using as many tomatoes as I did. 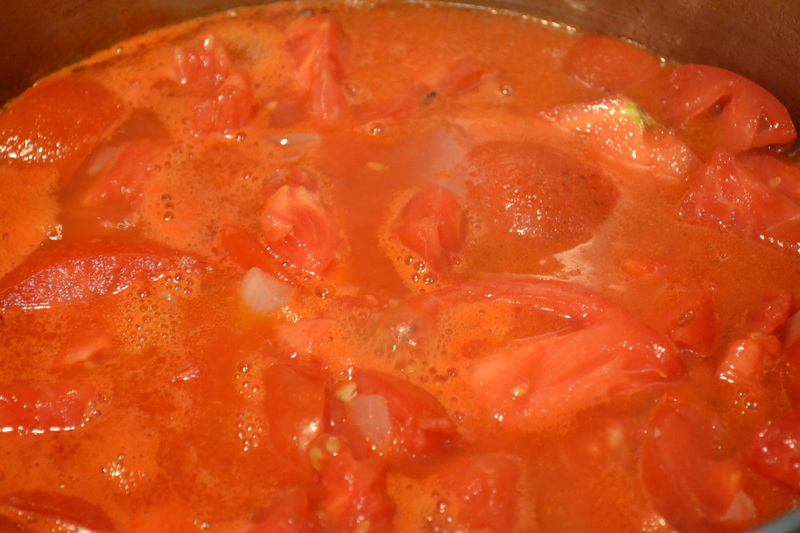 I used one very large onion for about 15 or 20 tomatoes. Some of my tomatoes had mold growing where they had split. I chopped that part off and used the rest. Disclaimer! 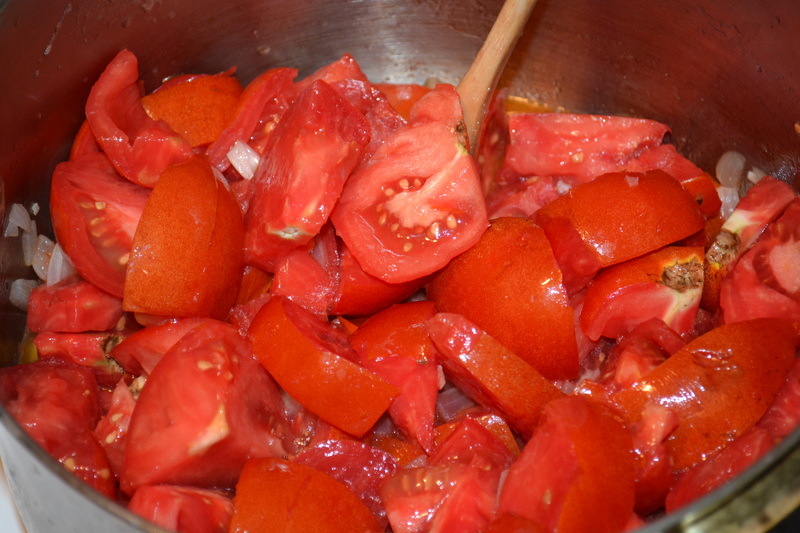 It is best to boil the tomatoes for a few seconds in order to peel them, and it is probably best to discard the pulp and seeds. Not my style though. Way too finicky for a weekday. In my sauce, it ALL goes in. 2. Smash a few plump garlic cloves with the flat of your knife and take off the peel. No need to chop what shall disintegrate after four hours of cooking. 3. Heat up a good glug of olive oil and gently fry the onion and garlic ‘for a spell’. When soft and translucent add in the mountain of tomatoes. Bring to a boil and then turn down to simmer. 4. Cook and cook and cook. 5. 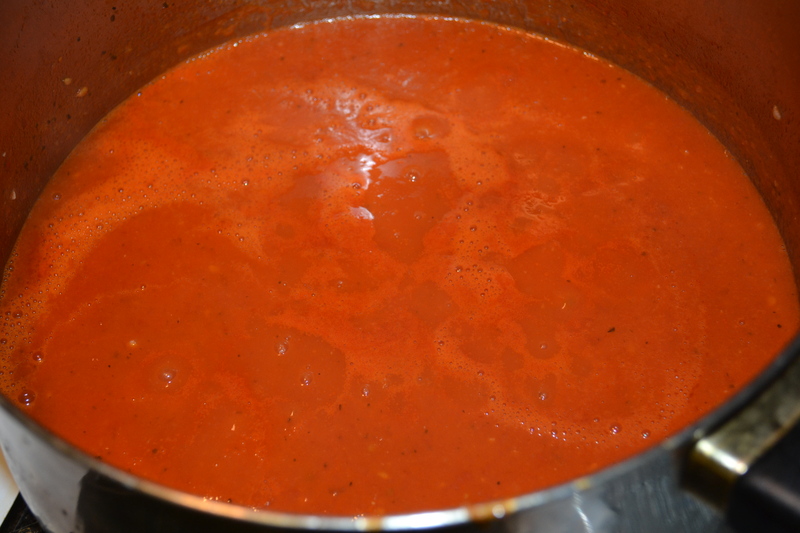 When things are beginning to resemble a tomato soup, add in the seasoning. Depending on the kind of and flavor of tomatoes you may not need vinegar or wine for the tang, or sugar for the sweetness. I started with the basil and salt and pepper, then came back a half hour later, tasted and reassessed. A tbs of red wine vinegar went in, along with a tbs of sugar. After a little more simmering I could have eaten this stuff on its own. Just delicious. But keep on cooking. 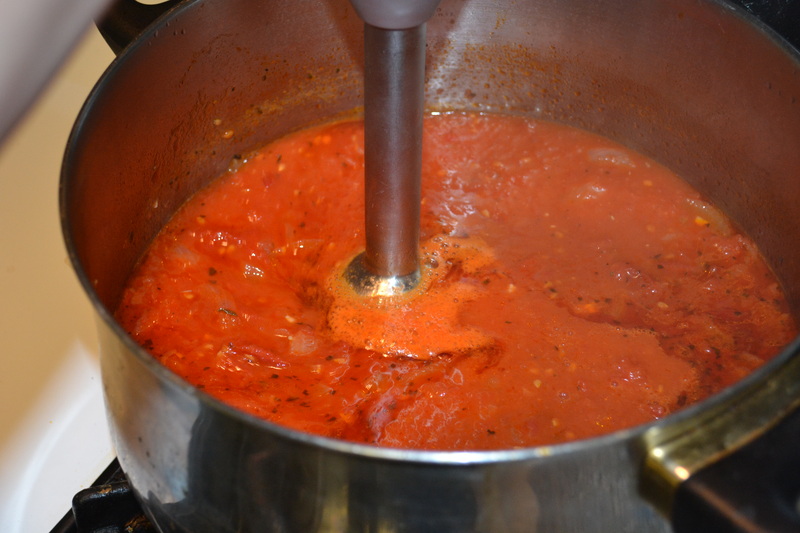 You want the sauce to reduce as much as possible and get richer and richer. After about four hours I blitzed it with a hand-held blender, added a glug of extra virgin olive oil, and was pretty much done. 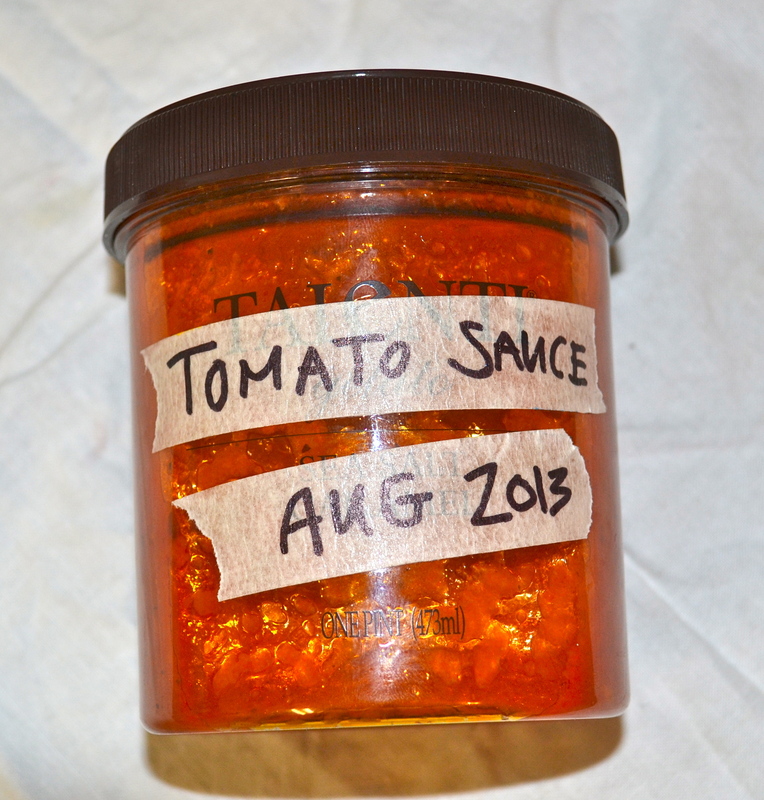 I now have about 8 jars of sauce–most of them in my freezer. We’ve had it on pasta, roasted mushrooms, eggplant and pizza so far. Hello! I was wondering if this could all be done in a crock pot instead of on the stove all day? Please email me with a response if you can! Thank you! I’m sorry I’m late getting back to you. Simmering on low is fine as it will cook for a long time. I hope it worked out for you!